Hear an exclusive concert event with The Cure recorded at The N.E.C., Birmingham On December 6th 1987 as part of Sirius XM’s BBC Vaults series with exclusive access to 40 years of timeless concert recordings. It's a 1 hour edit of the show. Here's what they aired: Torture, A Strange Day, A Japanese Dream, Catch, If Only Tonight We Could Sleep, Like Cockatoos, The Walk, The Perfect Girl, The Snakepit, A Forest, Fight, Charlotte Sometimes. I posted about this on the Curespotting page a few weeks ago, but this article from Stereogum (also at Spin) seems to be the first time people have really noticed it. So I'm posting it on the front page for anyone else who might have missed it the first time. The epic Cure in Mexico City show (April 21st, 2013). Applauze pre-sale for single day tickets is now live. Tip from @nil_by_mouth: "There's no booking fee when using the app. $139 even. $8 fee via ticketfly." 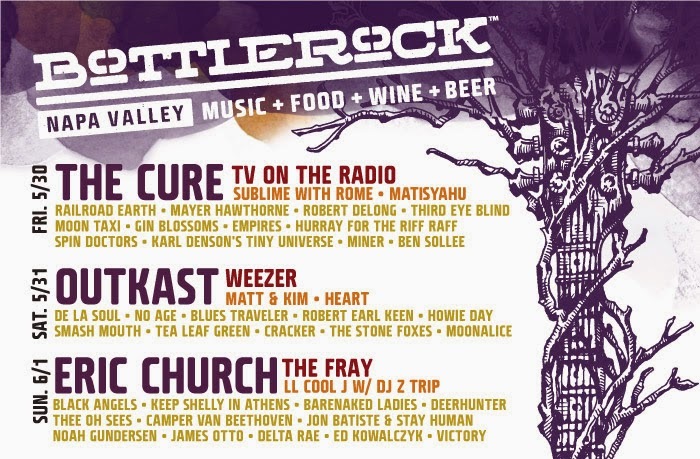 BottleRock pre-sale is now live. Use promo code DAYOFF to save $10 until Tuesday, when the general on sale starts. Also, the lineups for each day have been posted. Update (4/20/14): Auction is now over. Thanks to Christine for these totals, which do not include all of the autographed programs.